Time moves on, the world changes. So does Domina. It gets more attractive, perfect and faultless – not even on yearly but on monthly and daily basis. And if Domina gets better, why should its website remain the same? After all, those who don’t keep up with the times are bound to stay behind. And will be able to observe everything from afar. That’s why the design of Domina’s website has been improved by mendo. 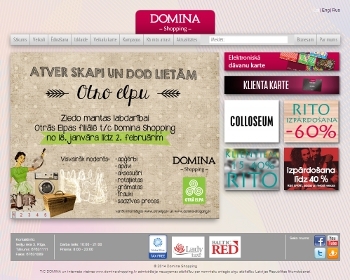 If Domina is the major fashion show in Riga, its website is a fashion show on the Internet. The new design is more vigorous, impressive, and powerful. The website is based on state-of-the-art technological solutions and features a user-friendly map of the shopping centre and highly effective search engine.